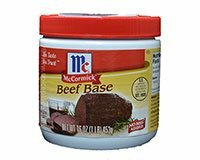 McCormick Beef Base has been discontinued by McCormick. We still offer a similar item Tones Beef and Chicken Soup Bases. Real Beef Base, add to brown sauces, gravies, dips marinades,and cooking liquids for rice or vegetables. No MSG added (except for that which naturally occurs in Autolyzed Yeast Extract). McCormick Beef Base is a simple a convenient way to make recipes calling for broth or stock. Just dissolve the beef base in boiling water and use in place of broth or stock. The recommended usage of McCormick Beef Base is 1 teaspoon Beef Base to 1 cup boiling water or 1 1/2 tablespoons to make 1 quart of beef broth or beef stock. You may also substitute 1 tsp McCormick Beef Base in place of one beef bouillon cube. McCormick Beef Base is great for sauces and gravies, soups and stews, casseroles and chili recipes. To add flavor to your favorite side dishes, rice and casseroles, prepare recipe as usual and add 1 tsp McCormick Beef Base to every 1 cup of water called for in the recipe. 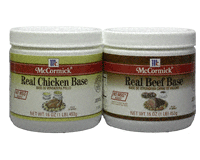 Use McCormick Beef Base anywhere a recipe calls for beef stock or beef broth. Make an easy Beef Gravy Recipe by dissolving 1 tablespoon of McCormick Beef Base in 2 cups of water. Mix 1/4 cup roasted meat drippings with 1/4 cup flour in a saucepan until well blended. Gradually stir in Beef Base Mixture until smooth, Cook over medium heat, stirring frequently, until gravy boils and thickens. Serve with roasted meat, mashed potatoes or over rice. Heat oil in medium size saucepan over medium heat. Add rice and onions, cook until rice begins to brown. Dissolve McCormick Beef Base in water. Pour into sauce pan. Stir in Italian Seasoning. Bring to a boil. Reduce heat to a simmer and cook for 20 minutes or until rice is tender and waster has been absorbed. Do not stir rice while cooking. Remove from heat and let stand for 5 minutes before serving.